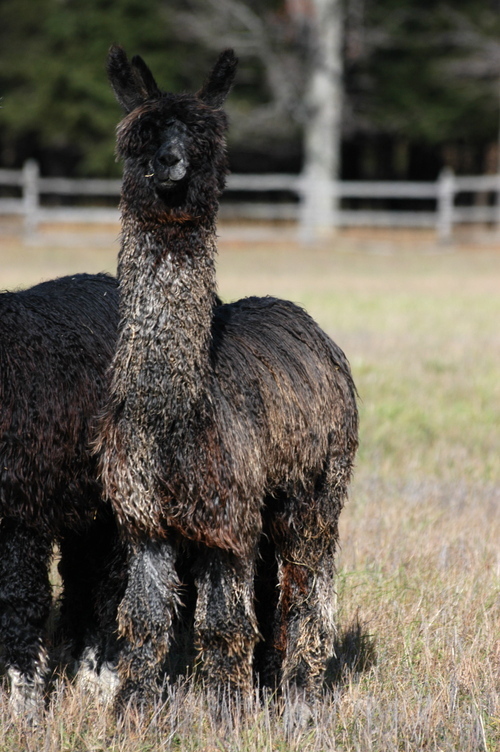 GLR Taj was the last cria born on the GLR ranch in 2013. And what a way for him to end up our birthing season. This little guy, at the time they thought to be one of their very best cria born on the ranch that year. He is an absolute clone of his sire, GLR Kolaqua, who was a two time AOBA Grey Color Champion. He has the tell tale wrinkled skin that comes with density which doesn't surprise us, as his dad's first shearing weight was almost 12 pounds. He had more wrinkles in fact than any other grey they have ever produced on their ranch. His mother GLR Tashi, is the daughter of GLR Tica who was a Color Champion and one of the very first colored Judges Choices.He has a pedigree packed with colored genetics, excellent fiber characteristics and conformation and we have high hopes that this young boy will be as successful as his papa both in the show ring and as a breeder of champion offspring. His full sister, GLR Tashina was the Reserve Grey Female Color Champion as a juvenile at the 2013 AAA Futurity and MAPACA and Grey Color Champion at the 2014 AOA Nationals. GLR Tashina ended her show careers by being named the very first grey Judges Choice, male or female. Taj at 25 months old, had a micron of 19.3. His regrowth is impressive and he has matured superbly. He has taken his place in our stud row and we are actively using him in our breeding program this year. We look forward to seeing what he produces in 2017.